Season the skirt steak with salt and pepper. 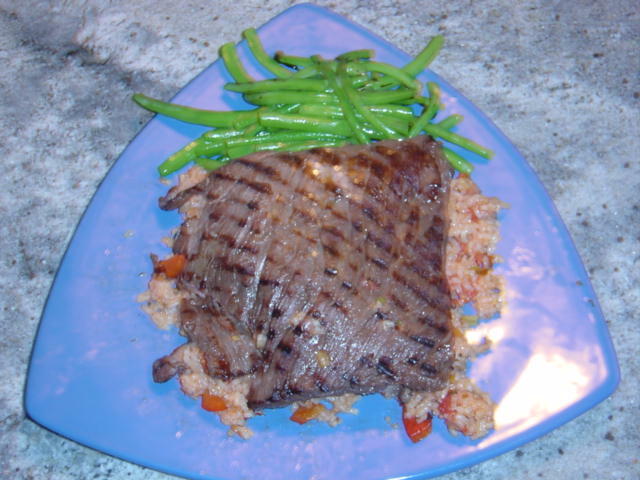 Place the skirt steak in a vacuum pouch with about 2 TBLS Teriyaki Marinade,(See reicpe below) and a slice of galic, and about a tablespoon of oil (I use grapeseed... do not use olive oil). Seal. Place in water bath at about 54.4C (130F). This is a little low to break down the colagen, but still works. Leave in bath for about 24 hours. Combine ingredients. 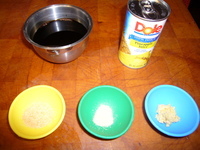 Use sauce to marinate chicken, pork chops, spare ribs, even hamburger patties. Marinate at least 1 hour. Cook on covered grill, basting occasionally with teriyaki sauce. Saute the celery, onion, and peppers in the oil till tender. 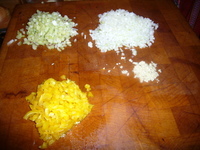 Add rice, mix, adjust seasoning, and allow to rest for 10 minutes.